Arab extremists coordinate multiple riots in Judea, Samaria and Gaza; attempt to mimic Israeli 'memorial siren' falls flat. Hundreds of Arab residents of Judea, Samaria and Gaza rioted on Thursday for "Nakba Day," the Arabic word for catastrophe designating the creation of the Jewish state of Israel 66 years ago, when hundreds of thousands of local Arabs left Israel at the behest of invading Arab armies. While Arab citizens of Israel annually protest by the thousands the existence of the state whose citizenship they enjoy on Israeli Independence Day, which follows the Hebrew calendar for the foundation of Israel, Arab residents of Judea, Samaria and Gaza follow the Gregorian calendar date of May 15 to express their hatred of Israel. 150 Arab rioters besieged Ofer Prison, to the north of Jerusalem and just outside Ramallah, apparently demanding the release of jailed terrorists in addition to the general anarchy of "Nakba Day." Pressed by the violent masses, a border policeman reportedly shot one of the rioters in the chest, with Arab medics saying the man had been transferred to a Ramallah hospital. AFP cited Arab medics saying the man was declared dead on arrival at the hospital. Udeh, 17, saying both died at a Ramallah hospital after being shot. Five border patrol officers were lightly wounded after Arab rioters threw rocks at them in the village of Walaja, located near Bethlehem south of Jerusalem. Roughly 800 Arab rioters wreaked havoc in the area, with many of them trying to break through the Ein Yael security checkpoint. Another 200 Arab rioters protested at Jerusalem's Damascus Gate, on the north wall of the Old City. There they burned Israeli flags and threw stones at police officers. Four of the protesters were brought in for investigation. In Abu Dis, to the north-east of Bethlehem on the outskirts of Jerusalem, roughly 15 local Arabs went wild, hurling stones and rolling burning tires at security officers. Armed and masked terrorists marched in Abu Dis just this February, firing shots in the air at various intervals according to reports. In Beitunia, just north of Jerusalem and near Ramallah, some 50 Arab rioters bore down on IDF soldiers who responded with riot dispersal methods. 12 rioters were reportedly lightly injured by rubber bullets. 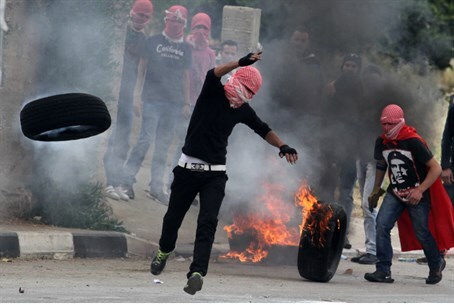 In the Kalandiya suburb just north of Jerusalem rioters also threw stones and rolled burning tires at border police, who likewise responded with riot dispersal means, reports AFP. Arab extremists were also throwing rocks at security forces and visitors at the Tomb of Rachel near Bethlehem. Similarly riots took flared up in Shechem (Nablus) in Samaria, as well as Hevron. Gaza got in on the action too, a hundreds of rioters marched near the Erez crossing leading into Israel. The riots followed official ceremonies in which top Palestinian Authority (PA) officials declared that they would never rest until the descendant of every single Arab who fled Israel in 1948 was restored to the land their families lived on previously, even if it was beyond the 1948 armistice lines. Speeches were followed by a siren, at which all PA Arabs were expected to stand still for 60 seconds, similar to the memorial sirens sounded in Israel on Holocaust Remembrance Day and Memorial Day. However, many residents of Jewish towns in Judea and Samaria adjacent to Arab villages said that they did not hear any sirens at all during the day, and if the siren was broadcast at any time on PA radio, it must have been ignored, because at no time did drivers whose vehicles bore PA license plates stand next to their vehicles at attention, as Israelis do when the siren is sounded. Speaking at a broadcasted event Wednesday evening, PA Chairman Mahmoud Abbas declared "on this 66th anniversary of the Nakba we hope that this year will be the one in which our long suffering ends." "It is time to put an end to the longest occupation in modern history and time for Israel's leaders to understand that there is no other homeland for the Palestinians but Palestine," added Abbas. For the first time in nearly a decade, Hamas was taking full part in Nakba events. Hamas terrorists joint with PA commemorations in Nakba events in major PA cities, and were allowed to display their flags and rally supporters openly. Since the takeover of Gaza by Hamas in 2007, public displays of Hamas support in PA-controlled areas of Judea and Samaria have been illegal, and PA police have detained Hamas supporters. However, Hamas has once again become legal in these areas, after Fatah and Hamas signed a cooperation agreement last month. On Wednesday night, MK Fania Kirschenbaum (Likud-Beiteinu) sent a letter to Finance Minister Yair Lapid, asking him to cut off funding to organizations that commemorate the Nakba. The Knesset three years ago passed a law demanding that the government stop funding Israeli organizations that hold such events. That law has not been enforced to a large extent, Kirschenbaum said.